The Church of the Nativity, traditionally considered the birthplace of Jesus, is one of several sites to have been designated as World Heritage Sites and World Heritage in Danger in the same year. The List of World Heritage in Danger is compiled by the United Nations Educational, Scientific and Cultural Organization (UNESCO) through the World Heritage Committee according to Article 11.4 of the World Heritage Convention,[nb 1] which was established in 1972 to designate and manage World Heritage Sites. Entries in the list are threatened World Heritage Sites for the conservation of which major operations are required and for which "assistance has been requested". The list is intended to increase international awareness of the threats and to encourage counteractive measures. Threats to a site can be either proven imminent threats or potential dangers that could have adverse effects on a site. In the case of natural sites, ascertained dangers include the serious decline in the population of an endangered or other valuable species or the deterioration of natural beauty or scientific value of a property caused by human activities such as logging, pollution, settlement, mining, agriculture and major public works. Ascertained dangers for cultural properties include serious deterioration of materials, structure, ornaments or architectural coherence and the loss of historical authenticity or cultural significance. Potential dangers for both cultural and natural sites include development projects, armed conflicts, insufficient management systems or changes in the legal protective status of the properties. In the case of cultural sites, gradual changes due to geology, climate or environment can also be potential dangers. Before a property is inscribed on the List of World Heritage in Danger, its condition is assessed and a potential programme for corrective measures is developed in cooperation with the State Party involved. The final decision about inscription is made by the committee. Financial support from the World Heritage Fund may be allocated by the committee for listed properties. The state of conservation is reviewed on a yearly basis, after which the committee may request additional measures, delete the property from the list if the threats have ceased or consider deletion from both the List of World Heritage in Danger and the World Heritage List. Of the two Former UNESCO World Heritage Sites, the Dresden Elbe Valley was delisted after placement on the List of World Heritage in Danger while the Arabian Oryx Sanctuary was directly delisted. As of 2017, there are 54 entries (17 natural, 37 cultural) on the List of World Heritage in Danger. Some sites have been designated as World Heritage Sites and World Heritage in Danger in the same year, such as the Church of the Nativity, traditionally considered to be the birthplace of Jesus. Arranged by the UNESCO regions 22 of the listed sites are located in the Arab States (of which 7 are located in Syria and 5 in Libya), 15 in Africa (of which 5 are in the Democratic Republic of the Congo), 7 in Latin America and the Caribbean, 6 in Asia and the Pacific, and 4 in Europe and North America (all by 2017). The majority of the endangered natural sites (11) are located in Africa. In some cases, danger listing has sparked conservation efforts and prompted the release of funds, resulting in a positive development for sites such as the Galápagos Islands and Yellowstone National Park, both of which have subsequently been removed from the List of World Heritage in Danger. Despite this, the list itself and UNESCO's implementation of it have been the focus of criticism. In particular, States Parties and other stakeholders of World Heritage Sites have questioned the authority of the Committee to declare a site in danger without their consent. Until 1992, when UNESCO set a precedent by placing several sites on the danger list against their wishes, States Parties would have submitted a programme of corrective measures before a site could be listed. Instead of being used as intended, the List of World Heritage in Danger is perceived by some states as a black list and according to Christina Cameron, Professor at the School of Architecture, Canada Research Chair on Built Heritage, University of Montreal, has been used as political tool to get the attention of States Parties. The International Union for Conservation of Nature (IUCN) notes that UNESCO has referenced the List of World Heritage in Danger (without actually listing the site) in a number of cases where the threat could be easily addressed by the State Party. The Union also argues that keeping a site listed as endangered over a long period is questionable and that other mechanisms for conservation should be sought in these cases. There are a number of sites that were previously listed as being in danger, but they were later removed from the list after improvements in management and conservation. The Everglades National Park was listed from 1993 to 2007 and again since 2010; the Río Plátano Biosphere Reserve was listed from 1996 to 2007 and again since 2011. Both are therefore included in the list of currently listed sites (above). ^ The Jerusalem site is not associated with a state by UNESCO and sorts as "Jerusalem". ^ Site proposed by Jordan. UNESCO has stated that "In line with relevant UN resolutions, East Jerusalem remains part of the occupied Palestinian territory, and the status of Jerusalem must be resolved in permanent status negotiations between Israel and the Palestinians." ^ Kosovo is the subject of a territorial dispute between the Republic of Kosovo and the Republic of Serbia. The Republic of Kosovo unilaterally declared independence on 17 February 2008, but Serbia continues to claim it as part of its own sovereign territory. The two governments began to normalise relations in 2013, as part of the Brussels Agreement. Kosovo has been recognized as an independent state by 112 out of 193 United Nations member states. 10 states have recognized Kosovo only to later withdraw their recognition. ^ "Convention concerning the protection of the World Cultural and Natural Heritage" (PDF). UNESCO. p. 6. Retrieved 10 December 2010. ^ "List of World Heritage in Danger". UNESCO. Retrieved 10 December 2010. ^ a b "Operational Guidelines for the Implementation of the World Heritage Convention" (PDF). UNESCO. January 2008. Retrieved 10 December 2010. ^ "Oman's Arabian Oryx Sanctuary: first site ever to be deleted from UNESCO's World Heritage List". UNESCO. Retrieved 10 December 2010. ^ "Dresden is deleted from UNESCO's World Heritage List". UNESCO. Retrieved 10 December 2010. ^ "List of World Heritage in Danger". UNESCO. Retrieved 13 July 2017. ^ "World Heritage List Statistics". UNESCO. Retrieved 13 July 2017. ^ Thorsell, J. W.; Sawyer, Jacqueline (1992). World heritage 20 years later (illustrated ed.). IUCN. p. 23. ISBN 978-2-8317-0109-7. Retrieved 5 September 2011. ^ "Abu Mena". UNESCO. Retrieved 28 May 2010. ^ "Abu Mena–Threats to the Site (2001)". UNESCO. Retrieved 27 August 2010. ^ "Air and Ténéré Natural Reserves". UNESCO. Retrieved 28 May 2010. ^ "Ancient City of Aleppo". UNESCO. Retrieved 17 August 2011. ^ "Ancient City of Bosra". UNESCO. Retrieved 17 August 2011. ^ "Ancient City of Damascus". UNESCO. Retrieved 17 August 2011. ^ "Ancient Villages of Northern Syria". UNESCO. Retrieved 17 August 2011. ^ "Archaeological Site of Cyrene". UNESCO. Retrieved 17 July 2016. ^ a b c d e "Libya's five World Heritage sites put on List of World Heritage in Danger". UNESCO. 13 July 2016. Retrieved 17 July 2016. ^ "Archaeological Site of Leptis Magna". UNESCO. Retrieved 17 July 2016. ^ "Archaeological Site of Sabratha". UNESCO. Retrieved 17 July 2016. ^ "Ashur (Qal'at Sherqat)". UNESCO. Retrieved 28 May 2010. ^ "Chan Chan Archaeological Zone". UNESCO. Retrieved 28 May 2010. ^ "World Heritage Committee: Tenth session" (PDF). UNESCO. p. 6. Retrieved 26 June 2011. 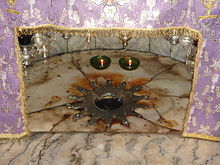 ^ "Birthplace of Jesus: Church of the Nativity and the Pilgrimage Route, Bethlehem". UNESCO. Retrieved 30 June 2012. ^ "Church of the Nativity and the Pilgrimage Route in Bethlehem, Palestine, inscribed on UNESCO World Heritage List along with sites from Israel, Palau, Indonesia and Morocco". UNESCO. Retrieved 30 June 2012. ^ Centre, UNESCO World Heritage. "City of Potosí". whc.unesco.org. Retrieved 30 March 2018. ^ "Coro and its Port". UNESCO. Retrieved 28 May 2010. ^ "Crac des Chevaliers and Qal'at Salah El-Din". UNESCO. Retrieved 17 August 2011. ^ "Cultural Landscape and Archaeological Remains of the Bamiyan Valley". UNESCO. Retrieved 28 May 2010. ^ World Heritage Committee. "World Heritage Committee inscribes East Rennell on the List of World Heritage in Danger". United Nations Educational, Scientific and Cultural Organization. Retrieved 13 August 2013. ^ "Everglades National Park". UNESCO. Retrieved 28 May 2010. ^ "World Heritage Committee: Seventeenth session" (PDF). UNESCO. pp. 20–21. Retrieved 26 June 2011. ^ "Fortifications on the Caribbean Side of Panama: Portobelo-San Lorenzo". UNESCO. Retrieved 27 October 2012. ^ "Panamanian fortifications inscribed on List of World Heritage in Danger". UNESCO. Retrieved 27 October 2012. ^ "Garamba National Park". UNESCO. Retrieved 28 May 2010. ^ World Heritage Committee. "The Iraqi site of Hatra added to the List of World Heritage in Danger". United Nations Educational, Scientific and Cultural Organization. Retrieved 14 July 2015. ^ "World Heritage Committee inscribes new site and approves extension of existing site on UNESCO's World Heritage List". UNESCO. Retrieved 7 July 2017. ^ "Historic Centre of Shakhrisyabz". UNESCO. Retrieved 17 July 2016. ^ "Historic Centre of Shakhrisyabz, Uzbekistan, added to List of World Heritage in Danger". UNESCO. 13 July 2016. Retrieved 17 July 2016. ^ "Historic Centre of Vienna inscribed on List of World Heritage in Danger". UNESCO. Retrieved 6 July 2017. ^ "Historic Town of Zabid". UNESCO. Retrieved 3 December 2010. ^ "Humberstone and Santa Laura Saltpeter Works". UNESCO. Retrieved 28 May 2010. ^ "Kahuzi-Biega National Park". UNESCO. Retrieved 28 May 2010. ^ "Lake Turkana National Parks". UNESCO. Retrieved 30 June 2018. ^ "Lake Turkana National Parks (Kenya) inscribed on List of World Heritage in Danger". UNESCO. Retrieved 30 June 2018. ^ "Liverpool – Maritime Mercantile City". UNESCO. Retrieved 27 October 2012. ^ "World Heritage Committee places Liverpool on List of World Heritage in Danger". UNESCO. Retrieved 27 October 2012. ^ "Manovo-Gounda St Floris National Park". UNESCO. Retrieved 28 May 2010. ^ "Minaret and Archaeological Remains of Jam". UNESCO. Retrieved 28 May 2010. ^ "World Heritage Committee: Twenty-sixth session" (PDF). UNESCO. p. 55. Retrieved 26 June 2011. ^ "Medieval Monuments in Kosovo". UNESCO. Retrieved 3 December 2010. ^ "Mount Nimba Strict Nature Reserve". UNESCO. Retrieved 28 May 2010. ^ "Nan Madol: Ceremonial Centre of Eastern Micronesia". UNESCO. Retrieved 18 July 2016. ^ "Four sites inscribed on UNESCO's World Heritage List". UNESCO. 15 July 2016. Retrieved 18 July 2016. ^ "Niokolo-Koba National Park". UNESCO. Retrieved 28 May 2010. ^ "Okapi Wildlife Reserve". UNESCO. Retrieved 28 May 2010. ^ "Old City of Jerusalem and its Walls". UNESCO. Retrieved 28 May 2010. ^ "World Heritage Committee: Sixth session" (PDF). UNESCO. pp. 10–12. Retrieved 26 June 2011. ^ "UNESCO replies to allegations". UNESCO. 15 July 2011. Retrieved 20 October 2011. ^ a b World Heritage Committee. "Yemen's Old City of Sana'a and Old Walled City of Shibam added to List of World Heritage in Danger". United Nations Educational, Scientific and Cultural Organization. Retrieved 15 July 2015. ^ "Old Town of Ghadamès". UNESCO. Retrieved 17 July 2016. ^ "Old Towns of Djenné". UNESCO. Retrieved 17 July 2016. ^ "Mali's Old Towns of Djenné on List of World Heritage in Danger". UNESCO. 13 July 2016. Retrieved 17 July 2016. ^ "Palestine: Land of Olives and Vines – Cultural Landscape of Southern Jerusalem, Battir". UNESCO. Retrieved 25 February 2015. ^ "Palestine: Land of Olives and Vines - Cultural Landscape of Southern Jerusalem, Battir, inscribed on World Heritage List and on List of World Heritage in Danger". UNESCO. Retrieved 25 February 2015. ^ "Rainforests of the Atsinanana". UNESCO. Archived from the original on 27 August 2011. Retrieved 28 May 2010. ^ "Río Plátano Biosphere Reserve". UNESCO. Retrieved 25 June 2011. ^ "Rock-Art Sites of Tadrart Acacus". UNESCO. Retrieved 17 July 2016. ^ "Salonga National Park". UNESCO. Retrieved 28 May 2010. ^ "Samarra Archaeological City". UNESCO. Retrieved 28 May 2010. ^ Centre, UNESCO World Heritage. "Selous Game Reserve". whc.unesco.org. Retrieved 30 March 2018. ^ "Site of Palmyra". UNESCO. Retrieved 17 August 2011. ^ "Timbuktu". UNESCO. Retrieved 27 October 2012. ^ a b "Heritage sites in northern Mali placed on List of World Heritage in Danger". UNESCO. Retrieved 27 October 2012. ^ "Tomb of Askia". UNESCO. Retrieved 27 October 2012. ^ "Tombs of Buganda Kings at Kasubi". UNESCO. Retrieved 28 May 2010. ^ "Tropical Rainforest Heritage of Sumatra". UNESCO. Retrieved 25 June 2011. ^ "Danger listing for Indonesia's Tropical Rainforest Heritage of Sumatra". UNESCO. Retrieved 26 July 2011. ^ "Virunga National Park". UNESCO. Retrieved 28 May 2010. ^ "World Heritage Committee: Eighteenth session" (PDF). UNESCO. pp. 21, 51. Retrieved 26 June 2011. ^ "Angkor". UNESCO. Retrieved 28 May 2010. ^ "Bagrati Cathedral and Gelati Monastery". UNESCO. Retrieved 3 December 2010. ^ "Gelati Monastery, Georgia, removed from UNESCO's List of World Heritage in Danger". UNESCO. Retrieved 13 July 2017. ^ "Bahla Fort". UNESCO. Retrieved 26 June 2010. ^ "World Heritage Committee: Twelfth session" (PDF). UNESCO. p. 19. Retrieved 28 May 2010. ^ "World Heritage Committee: Eleventh session" (PDF). UNESCO. p. 7. Archived from the original (PDF) on 5 February 2012. Retrieved 26 June 2011. ^ "Bam and its Cultural Landscape". UNESCO. Retrieved 3 December 2010. ^ "World Heritage Committee removes the Iranian World Heritage site of Bam and its Cultural Landscape from danger listing". UNESCO. Retrieved 13 July 2013. ^ "Belize Barrier Reef Reserve System". UNESCO. Retrieved 28 May 2010. ^ "Belize Barrier Reef Reserve System removed from the List of World Heritage in Danger". UNESCO. Retrieved 27 June 2018. ^ "Butrint". UNESCO. Retrieved 26 June 2010. ^ "Cologne Cathedral". UNESCO. Retrieved 26 June 2011. ^ "Comoé National Park". UNESCO. Retrieved 28 May 2010. ^ "Djoudj National Bird Sanctuary". UNESCO. Retrieved 26 June 2011. ^ "World Heritage Committee: Twelfth session" (PDF). UNESCO. pp. 7, 16. Retrieved 26 June 2011. ^ "Dresden Elbe Valley". UNESCO. Retrieved 26 June 2011. ^ "Dubrovnik". UNESCO. Retrieved 26 June 2011. ^ "World Heritage Committee: Fifteenth session" (PDF). UNESCO. p. 31. Retrieved 26 June 2011. ^ "World Heritage Committee: Twenty-second session" (PDF). UNESCO. pp. 12–13. Retrieved 26 June 2011. ^ "Fort and Shalamar Gardens in Lahore". UNESCO. Retrieved 28 May 2010. ^ "Galápagos Islands". UNESCO. Retrieved 26 June 2011. ^ "Group of Monuments at Hampi". UNESCO. Retrieved 26 June 2011. ^ "Historical Monuments of Mtskheta". UNESCO. Retrieved 3 December 2010. ^ "Ichkeul National Park". UNESCO. Retrieved 26 June 2011. ^ "Iguaçu National Park". UNESCO. Retrieved 26 June 2011. ^ "Kathmandu Valley". UNESCO. Retrieved 26 June 2011. ^ World Heritage Committee. "Colombia's Los Katíos National Park removed from List of Heritage in Danger". United Nations Educational, Scientific and Cultural Organization. Retrieved 15 July 2015. ^ "Manas Wildlife Sanctuary". UNESCO. Retrieved 28 May 2010. ^ "Successful preservation of India's Manas Wildlife Sanctuary enables withdrawal from the List of World Heritage in Danger". UNESCO. Retrieved 28 May 2010. ^ "Natural and Culturo-Historical Region of Kotor". UNESCO. Retrieved 26 June 2011. ^ "World Heritage Committee: Third session" (PDF). UNESCO. p. 13. Retrieved 26 June 2011. ^ "World Heritage Committee: Eighth session" (PDF). UNESCO. p. 18. Retrieved 26 June 2011. ^ "Ngorongoro Conservation Area". UNESCO. Retrieved 26 June 2011. ^ a b "World Heritage Committee: Thirteenth session" (PDF). UNESCO. p. 14. Retrieved 26 June 2011. ^ "Plitvice Lakes National Park". UNESCO. Retrieved 26 June 2011. ^ "Rice Terraces of the Philippine Cordilleras". UNESCO. Retrieved 28 June 2012. ^ "Royal Palaces of Abomey". UNESCO. Retrieved 26 June 2011. ^ "Royal Palaces of Abomey: Advisory Body Evaluation" (PDF). UNESCO. Retrieved 26 June 2011. ^ "World Heritage Committee: Ninth session" (PDF). UNESCO. p. 7. Archived from the original (PDF) on 20 September 2011. Retrieved 26 July 2011. ^ "Ruins of Kilwa Kisiwani and Ruins of Songo Mnara". UNESCO. Retrieved 28 May 2010. ^ "Rwenzori Mountains National Park". UNESCO. Retrieved 26 June 2011. ^ "Sangay National Park". UNESCO. Retrieved 26 June 2011. ^ "Simien National Park". UNESCO. Retrieved 1 August 2010. ^ "Srebarna Nature Reserve". UNESCO. Retrieved 26 June 2011. ^ "Timbuktu". UNESCO. Retrieved 26 June 2011. ^ "World Heritage Committee: Fourteenth session" (PDF). UNESCO. p. 8. Retrieved 26 June 2011. ^ "Tipasa". UNESCO. Retrieved 26 June 2011. ^ "World Heritage Committee: Twenty-sixth session" (PDF). UNESCO. pp. 36–37. Retrieved 26 June 2011. ^ "World Heritage Committee removes Baku from Danger List welcoming improvements in the ancient city's preservation". UNESCO. 25 June 2009. Retrieved 21 June 2016. ^ "Wieliczka Salt Mine". UNESCO. Retrieved 26 June 2011. ^ "World Heritage Committee: Twenty-second session" (PDF). UNESCO. p. 13. Retrieved 26 June 2011. ^ "Yellowstone National Park". UNESCO. Retrieved 26 June 2011. ^ "World Heritage Committee: Nineteenth session" (PDF). UNESCO. pp. 18–19. Retrieved 26 June 2011. "World Heritage in Danger: A compendium of key decisions on the conservation of natural World Heritage properties via the List of World Heritage in Danger" (PDF). Gland, Switzerland: IUCN. 2009. Retrieved 3 September 2011. Chape, Stuart; Spalding, Mark; Jenkins, Martin (2008). The world's protected areas: status, values and prospects in the 21st century (illustrated ed.). University of Castile-La Mancha. ISBN 978-0-520-24660-7. Retrieved 3 September 2011. Timothy, Dallen J.; Nyaupane, Gyan P. (2009). Cultural heritage and tourism in the developing world: a regional perspective. Contemporary geographies of leisure, tourism and mobility. 10 (illustrated ed.). Taylor & Francis. ISBN 978-0-415-77622-6. Retrieved 3 September 2011. "World Heritage Committee: Eighth session" (PDF). UNESCO. Retrieved 26 June 2011. "World Heritage Committee: Sixteenth session" (PDF). UNESCO. Retrieved 28 May 2010. "World Heritage Committee: Twentieth session" (PDF). UNESCO. Retrieved 26 June 2011. "World Heritage Committee: Twenty-first session" (PDF). UNESCO. Retrieved 28 May 2010. "World Heritage Committee: Twenty-third session" (PDF). UNESCO. Retrieved 26 June 2011. "World Heritage Committee: Twenty-fourth session" (PDF). UNESCO. Retrieved 26 June 2011. "World Heritage Committee: Twenty-fifth session" (PDF). UNESCO. Retrieved 26 June 2011. "World Heritage Committee: Twenty-seventh session" (PDF). UNESCO. Retrieved 26 June 2011. "World Heritage Committee: Twenty-eighth session" (PDF). UNESCO. Retrieved 26 June 2011. "World Heritage Committee: Twenty-ninth session" (PDF). UNESCO. Retrieved 26 June 2011. "World Heritage Committee: Thirtieth session" (PDF). UNESCO. Retrieved 26 June 2011. "World Heritage Committee: Thirty-first session" (PDF). UNESCO. Retrieved 26 June 2011. "World Heritage Committee: Thirty-third session" (PDF). UNESCO. Retrieved 26 June 2011. "World Heritage Committee: Thirty-fourth session" (PDF). UNESCO. Retrieved 26 June 2011.